Install over 220+ PHP aplications in just seconds with Softaculous script installer. 1Dollar-WebHosting.com offers the Lowest Priced Softaculous web hosting on the market. The following scripts can be auto-installed using Softaculous which is included with all our cPanel web hosting plans. 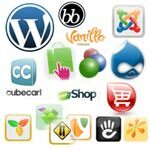 Softaculous is a FAST Auto Installer which you can use to install over 220 scripts in just 1 click. So you do not have to go through the process of Individual Script installers. Everything from copying the files to creating a databases is done by Softaculous.